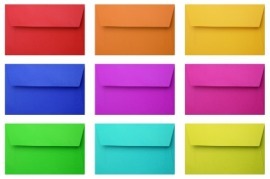 Envelopes could be your new best friend when it comes to personal finance. The other day I was at the drug store and I ran into an acquaintance in the check out line that I hadn't seen in a very long time. Now, while I always liked Tom (not his real name) I never thought he was particularly bright. That may have been caused by the time he planted grass at his new home and then installed a sprinkler system, which involved uprooting the newly planted grass. Now he has a bumpy yard. Perhaps it was simply poor planning. When the drug store cashier announced his total of $27 and some change, he reached into the breast pocket of his jacket and pulled out an envelope marked "Personal Items" and pulled out $30. He then put the change back into that envelope. I asked Tom what would happen if he didn't have the $27 in the "Personal Items" envelope. He said, "Well, I guess I couldn't buy this stuff." Not so dumb. First of all, it appears Tom is buying everything with cash. Well, most everything. I doubt he sends cash for the mortgage payment on the home with the uneven yard. Research shows you'll spend 20% less if you pay cash. Second, he sticks to his budget. This is called the envelope method; you cash your paycheck and put the money in separate envelopes for each of your expenses. When the envelope has no money in it, you have to wait until your next paycheck in order to make a purchase from that expense category. I trust Tom is smart enough not to carry around all his envelopes. (However, keep in mind the sprinkler episode.) At Liquid, were're creating a virtual envelope system with our patented budgeting method so you don't have to carry around all those envelopes. It's the best method of controlling your spending using all the latest technologies. Newer:Write it DownOlder:Oh, I Forgot That Big Lunch!